Don't forget to enter the NC Beer Month Getaway right HERE. I want you to experience everything you're going to read about over the next 4 minutes. Don't be shy. Click it. People ask me about the culinary identity of Winston-Salem all of the time. I give them a little hint, to frame the story: I can do my job ANYWHERE IN THE WORLD, but I chose to do it HERE. Back in 2007, when I returned from South Florida, I knew that change was happening and I thought, "Something delicious this way comes..." and that has come true. I believe Winston to be a coffee-loving, beer-drinking, bread-baking, hot sauce-slinging, hot dog-eating town. Beer and spirits run through the veins of the city, not unlike the forgotten underground springs of the city. 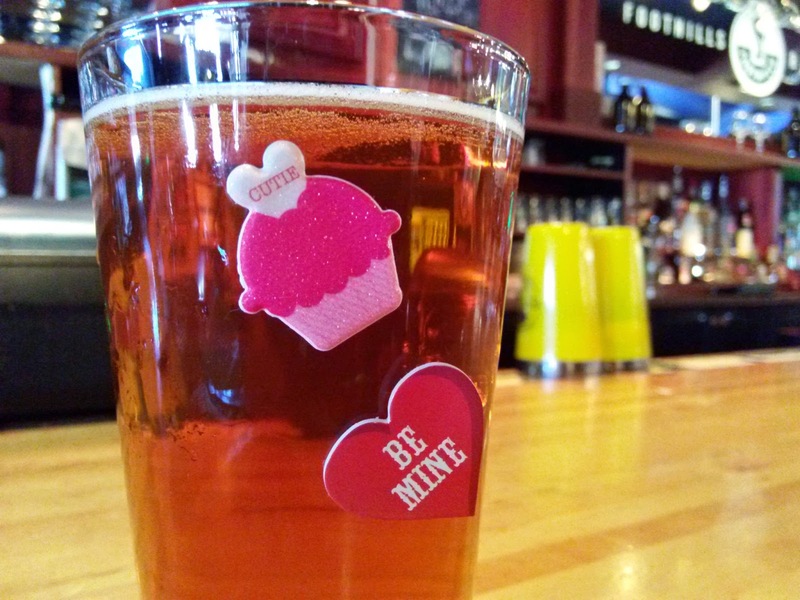 Beer and coffee are intertwined in that same way. 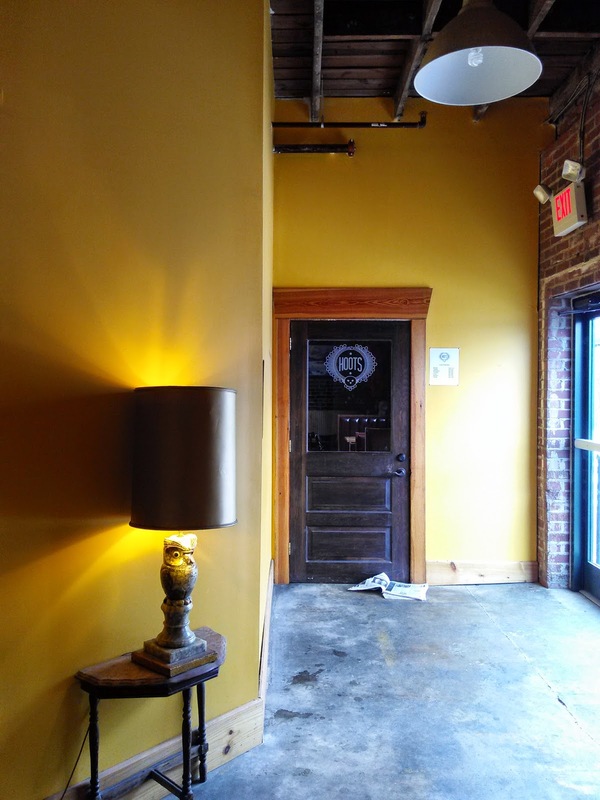 NC Beer Month celebrates all things beer, and one of the coolest places in Winston-Salem to get beer coffee Twin City Hive. 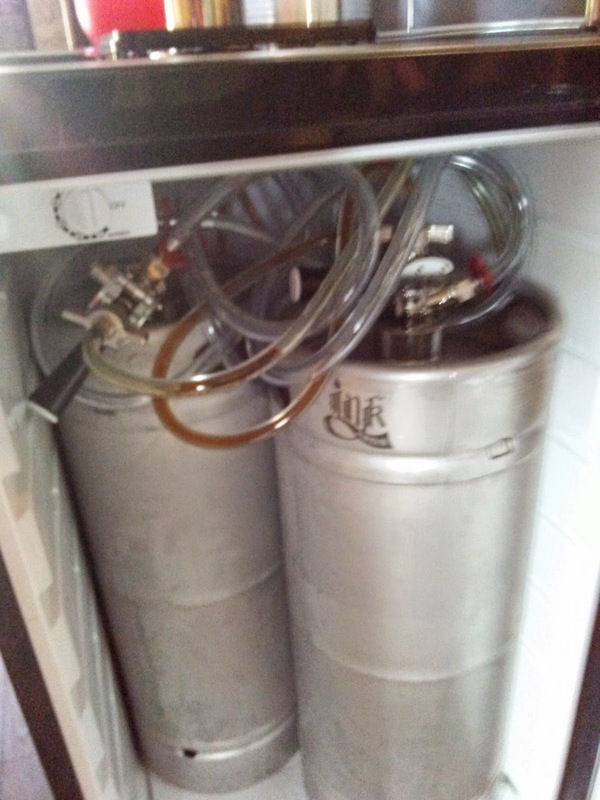 Beer on tap can run on two different systems, either CO² or nitrogen. CO² gives you carbonation like a soft beverage or soda. By adding nitrogen to a beer, it creates micro bubbles, that create a smooth, creamy mouthfeel. Other than mouthfeel, there are variances in appearance as well. You can watch the waterfall of tiny bubbles slowly yielding to a dark brew with a creamy, white head. Just like beer. At Twin City Hive, they put popular cold brew "on tap" and in kegs to produce a lovely signature product. There's coffee in them thar kegs! Watch the video below: Twin City Hive owner, Joey Burdette explains the process. 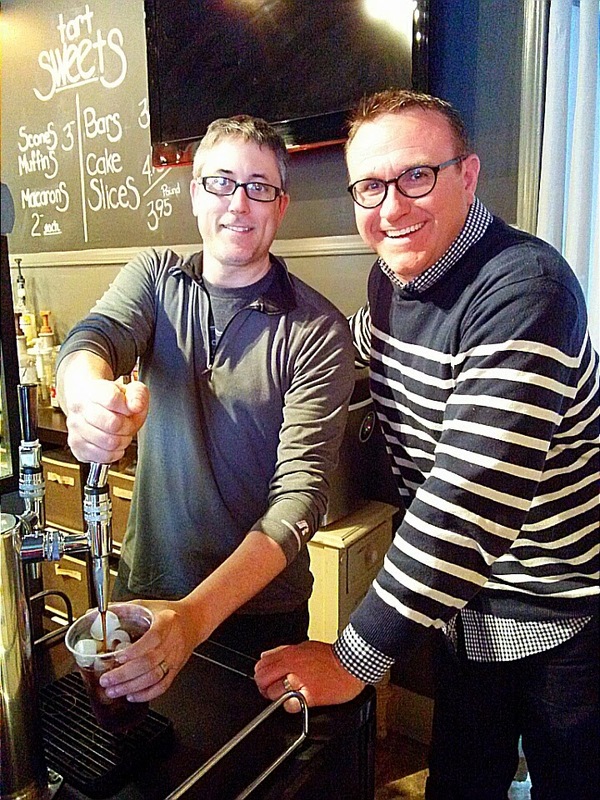 Twin City Hive owners, Terry Miller (left) and Joey Burdette (right) pour nitro infused cold brew for customers. Krankies Coffee is a local coffee roaster and community space that turns into a community art space called The Werehouse some evenings. Both coffee and beer are available at Krankies. In the City of Arts and Innovation this all makes sense because owner John Bryan has mixed coffee roasting, beer and spirits in not one, but two different locations. Enter Hoots Roller Bar & Beer Co. at West End Mill Works. The building is located at the apex of Mill Works (formerly Manly St.) and Bridge Streets. The neighboring brick warehouse was formerly a part of the Hoots Roller Mill Co., a flour mill. Now it's a brewery and bar. Krankies Coffee and Hoots Roller Bar had a collaboration in 2014 and made Morning Stout, an American Stout made with El Robles coffee beans roasted at Krankies. While the rotation of beers on tap change constantly, the things that remains the same are the commitment to excellence, the area's history and the local community. I can certainly see why you love your city! Sounds like a great foodie scene! It sounds as though I need to put Winston-Salem on my list of places to visit! I have never been but thanks to this post I NEED to visit for sure! Man - I have to say Winston-Salem and even Greensboro changed so much after I left! I hear about so many good foodie things from you and my friends that still live there. Only if it could have started just a few years earlier! What a cool process in what sounds like a fun city. How much fun, we love beer! Beer is the best! My husband and I sometimes plan our trips around what breweries and distilleries we can visit. Looks like we need to make our way south! If Winston-Salem wasn't already on my "to visit" list, you would have convinced me to add it! ;) That nitro infused beer sounds so cool. My boyfriend really digs beer. I was more of a wine girl until I met him. Now I love to go to different breweries, especially local ones! So much fun! I'll make sure to visit Winston if I'm ever south! Adding it to my to do list. It's so fun to discover new places to visit. I'm down for nitro infused anything, including beer. What a delicious place to spend the day. I really need to plan a trip to Winston-Salem! Sweet AROMAZ coffee shop on 6th Street between liberty St and trade St has the most amazing nitro cold brew I have tried all around in winston, is so smooth is hard for me not to keep going back to get more.